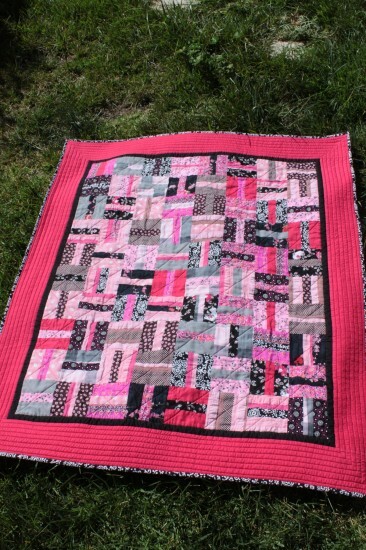 I don’t know what to call this quilt – but it’s done. 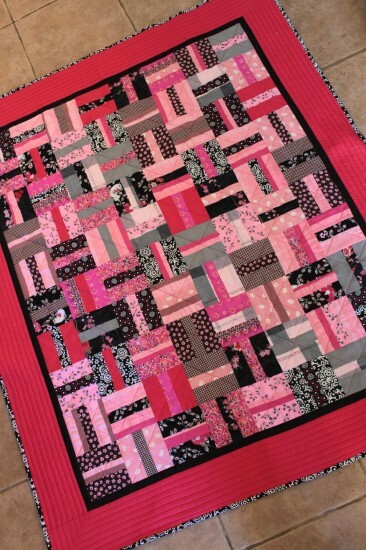 I started working on it early August, and it did take some time to have it quilted – mostly because the blocks were hanging on the wall while I was trying to figure out whether the whole thing will work or not. Then it grew on me so I decided to finish it. And then…. after I quilted it, it sat some time waiting to be bound. That hapened yesterday, and here it is. All done, photographed, washed, photographed again. Now it will be a matter of minutes before the dog figures out where it is. This quilt is for our sofa (otherwise the dog would not be able to get to it). The design (my own) called for 8 blocks per row. 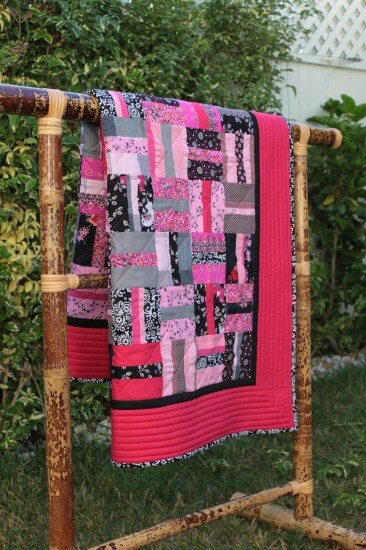 The idea is to use 16 different fabrics – 8 for the main fabric (the outer strips of each block) and 8 for the middle strip. That’s the first row. 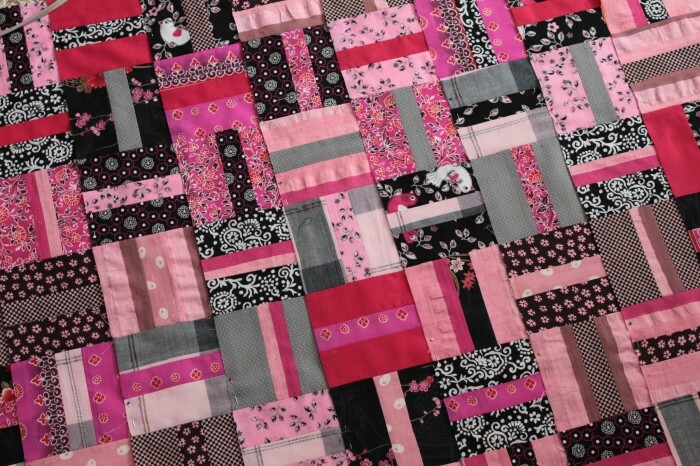 For the second row, I switched the main with the middle strip fabric for each block. Third row is same as the first row, except that I switched the middle fabric around – combined with different main fabric. In fourth row I switched main and middle fabric of each block from third row. 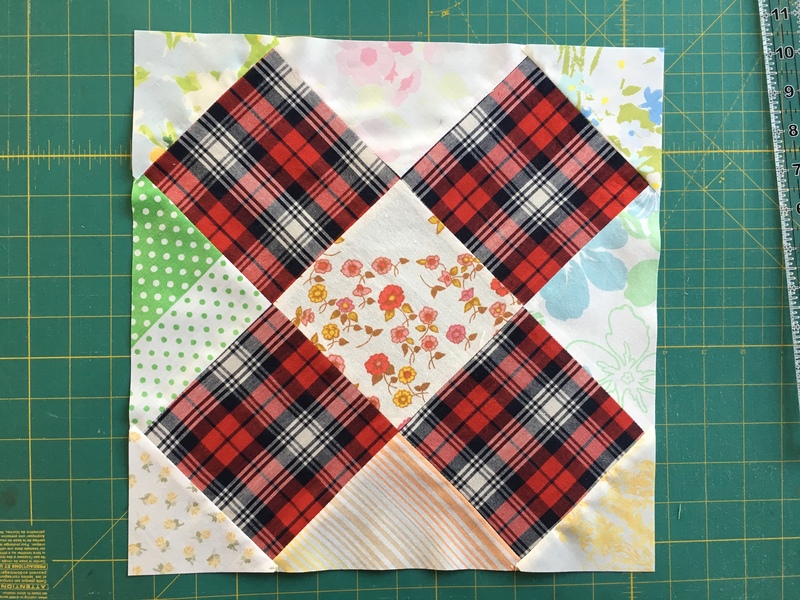 And so on… That way I didn’t have 2 blocks with the same fabric combination. All that said, I do have a little correction…. I did not really have 16 different fabrics. That was the idea, but I just could not find matching fabrics in my stash. However, some of the fabrics I used were floral prints or striped fabrics that if I cut a certail way, I woud basically have different fabrics, or patterns. That’s why some of the blocks look like they have more strips – that’s just an illusion – it’s just striped fabrics, cut differently for each block. As I mentioned, it took a while for me to figure out whether this will work or not. There is no solid white fabric, anywhere in this quilt. Colors are really bright and somewhat dark… definitely out of my comfort zone. So, it took more time to arrange the block, rearrange them and then learn to live with them, than actual cutting. Even though, some of the fabrics were a pain, since I had to find cut around the prints to get the colors I wanted. I wanted it to be thick but light and I had some pink fleece lying around so I used that for batting. 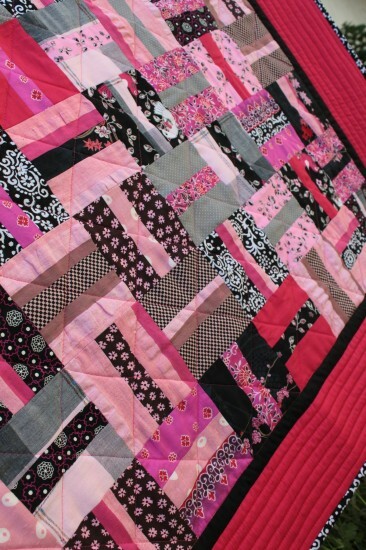 As for the quilting – I quilted diagonally thrugh each square, and then around the border. Pretty uneventfull. 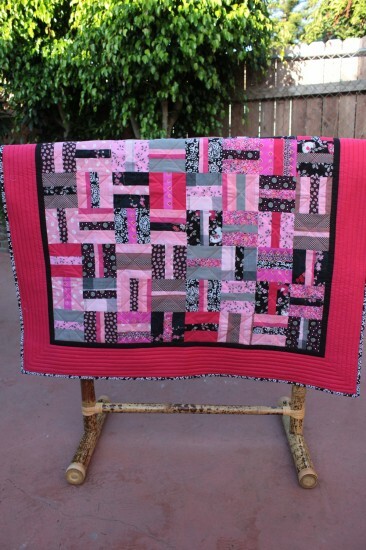 This entry was posted in fabrics, making, quilting, sewing and tagged Red quilt on August 24, 2010 by flekka.